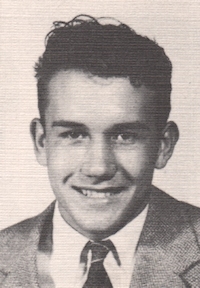 Obituary – Cowell, Otto Roy « Perry High School Alumni Association, Inc.
Vice President of Student Council ’46-’47; Football ’44-’47; Basketball ’44-’47; Basketball Captain ’46-’47; President of Home Room ’44-’45; Annual Staff ’45-’47; Perryscope Staff ’45-’47; Junior Play ’46-’47; Annual King Candidate ’45-’46. 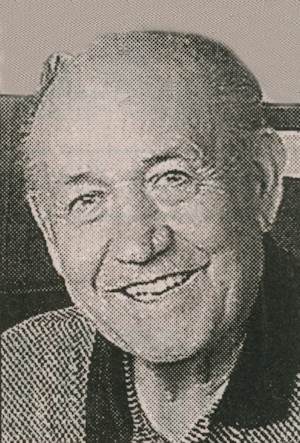 Otto Roy Cowell, 81, was the son of Roy Wilson and Lena Martha Baetz Cowell. He was born on March 5, 1929 in Perry, Oklahoma and died Thursday, September 16, 2010 at Tuscany Village Living Center in Oklahoma City. On June 4, 1949 Otto married Frances Vaynne Roberts at the Christ Lutheran Church in Perry, Oklahoma. Otto graduated from Perry High School in 1947 and attended Northern Oklahoma Junior College for one year. He then returned to Perry, Oklahoma to work as a bookkeeper at Exchange Bank in 1948. He worked his way up the ranks becoming head bookkeeper, teller, head teller, assistant cashier, assistant vice-president, cashier, director of Exchange Bank in Perry, Oklahoma. In 1964 he moved to Kingfisher, Oklahoma to become president of the newly opened Kingfisher Bank and Trust where he worked until he retired in 1974. He served as a Master Sergeant in the Korean War with the 179th Infantry in the 45th Division. He was a member of Christ Lutheran Church in Perry, Oklahoma where he served as an adult instructor for the bible class and served as president for seven years. In Kingfisher, Oklahoma, he was a member of Emmanuel Lutheran Church. In Clewiston, Florida, he was a member of New Harvest Church. Otto was a gifted athlete and enjoyed playing many different sports. He was a Player-manager of a semipro baseball team which won five state championships while he was manager. He received an All-American title as Outstanding Hitter at the Semi-pro Wichita National Tournament. Also, he was an avid golfer and was club champion in the championship flight at the Perry Golf and Country Club. Retirement allowed Otto to spend his time fishing and golfing in Moore Haven, Florida. Funeral services will be at 11 a.m. on Monday, September 20, 2010 at BrownDugger Funeral Home Chapel. Rev. Tony Miller, of Cathedral of Praise in Oklahoma City, Oklahoma will officiate. Interment will be in Grace Hill Cemetery. Services are under the direction of BrownDugger Funeral Home in Perry. Memorial contributions may be made to the Christ Lutheran Church or Quality Life Hospice in care of BrownDugger Funeral Home, 1010 N, 7th, Perry, Oklahoma 73077. Otto is survived by his wife, of 61 years, Vaynne Cowell three children, C. Scott Cowell of Edmond, Oklahoma, Rick L. Cowell and his wife, Annette, of Stillwater, Oklahoma and Kara Lynn Cowell White of Oklahoma City, Oklahoma three granddaughter, Anna Vaynne Cowell of San Antonio, Texas, Kelsey Nicole White of Conway, Arkansas, and Mackenzie Jean White of Stillwater, Oklahoma. He was preceded in death by his parents, his granddaughter Rebecca Katherine Cowell of Stillwater, Oklahoma and his sister Ethel Deloris Cowell Shiever of Morrison, Oklahoma.